Here it is, the favorite trestle, as you can see it has been used, so it was fair to make him some new. (In fact the wood was really fine still, except from the part of the legs standing on the ground). And here after it arrived in my workshop, many months later. 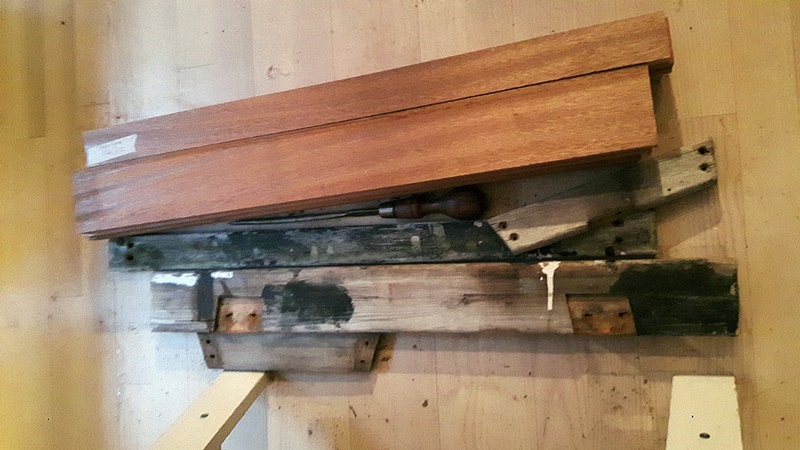 So first step was to tear them apart, to understand how they were made and to be able to take measures and angles to transfer to the new wood, that his friend had provided. Even the screws were quite fine, just surface rust. (They will not be used again). Lesson nr two, tell people to provide a little extra, there were exactly the wood needed, no room for mistakes. Also the dimensions he had provided were not the same as the originals, so here I had to start the improvisation. It is quite easy to work with and don’t splinter too easy, time will tell how it hold up outside and with ‘wet’ feet. Lets spend a moment looking at something calming. Notice the trestle next to the plane, it is a old model from the Danish carpenter school in Copenhagen, I rescued it from the trash many years back, when they cleaned up at the schools storage. Time to make a routing jig, just transfer angles from the originals and adding the copy ring size. Yes you heard me right, I am going to use my most hated tool, the router. (I hate noise and always found the router the most dangerous tool in the shop – finger eater). Time to make a test routing. I use a piece of pine for testing, same dimensions. Just cutting the legs on the miter saw, setting up stops. This is easy, since the angels both ends are the same, so all I needed was to remember to rotate and turn 180. Lesson no five, it is actually possible to remember, nothing went wrong, perfect cuts. So beams and legs cut. So back to the table saw cutting the first cut on the legs, for the lap joint. This is simple, just a 3mm deep cut that runs parallel with the end of the leg. My tenon jig was set up and the table saw blade adjusted to cut the lap. Took a little fiffeling, but then the cuts took a spilt second. Again there are left and rights, I turned the saw around for this round, as you can see on the blade. A little finish were done. Just what we call ‘breaking the edge’ in Denmark. This means you just take a wee pass or two, with the plane. This is to make a strong edge, that will not splinter. But as you can see still looks sharp. 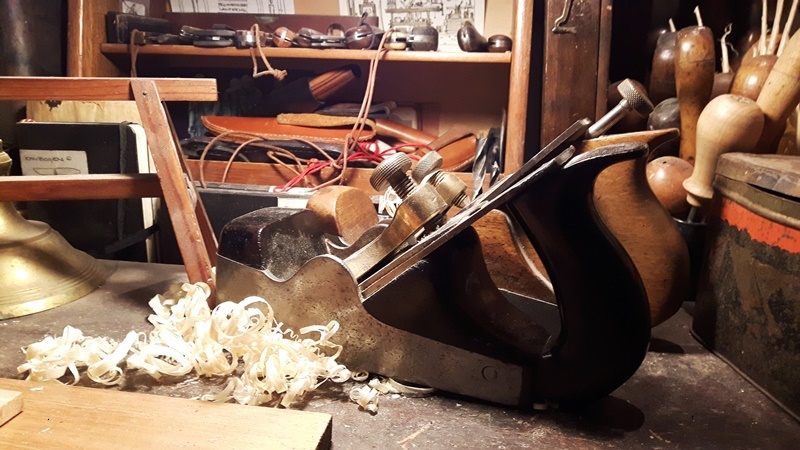 Here a low angle block plane is a gem. Marking up for screw positions on the legs. I think Jim J will smile here. Using a double marking gauge, one side for deepness and one for distance from sides. Then a small hole with the awl. On the beams I just need the distance from the side, so again I mark it with a marking gauge. Waterproof wood glue on the laps. Drilling with a countersink drill bit, just hit the marks. This time with rustproofed Phillips type. I tried to screw them in, holding them a little to one side and then to the other side, when turning the beam, this so they would not run into each other and it actually worked. Lesson nr six, don’t get too exited. Now I could cut the braces, since I could take the new width measures. Again mark up carefully for the screws, this will make a big difference visually at the end. I choose to make the markings visual, so they will add a charm to the trestles later. As with the legs, drill and screw. I did it like this, so I did not need any clamping. Now for the lower stretcher, I just lay it loose, at the center of the braces and mark the sides. At this point it is possible to measure the gap between the stretcher and the brace on the back side, due to the fact the legs are in an angle. This I transfer to the front side with a cutting gauge, just cutting a wee into the wood. Gently sawing a slit, from the front marking to the top in the back. (Wedge cut shaped if that’s more clear otherwise look three pictures down from here). With my favorite carpentry chisel, I now chisel out the wood. Wedge shape cut out for the stretcher, to lay flat and secure a stabile joint. Again marking up for the screws. And finally screw in the screws. My brother wanted ‘like the old once’, to have foam on top of the trestles, this to protect the boards. I just bought some of these water pipe insulation types, that he had before. But I was not happy with the look of them ‘opening up’ over the legs. So I made a foam tube cutting jig… Just two wood pieces to hole the tube in place and then a long piece, in same with as the top beam, to use as a ruler to cut from. Like this I could get 90 degree cuts down the sides and make the tubes fit the top beam perfectly. Hope this makes it understandable. Drilling holes for the mounting of the foam tubes, using a backing board, to avoid tear out. My brother used Gaffa tape, I could not settle with that. And we got three holes! Ok, we got a trestle with three fine holes. So foam tube on top. And I go for zip ties, since these will look more elegant than the Gaffa tape, yet easy to replace. Now we really got trestles. The trestle ready to go to my brothers place. (Now I just need to wait a few weeks before an appointment will be possible…). Actually now I write the blog, he has picked them up, he was so much more than happy. When I told him how I had struggled to make them just as the old once, he replied ‘why’... Lesson nr nine, ask if you have doubt. He oiled them back home and have used them now and can confirm they are just perfect and plenty strong, so I guess this must be a happy ending. Wonderful voyage of making your brother’s trestles, Mads! I’m certain he will think of you and your hard work every time he uses them. Glad to see you back on the blog with yeat another long, cheerfull writeup full of cosy shoptime and love for tools. Great project and thank you for a joyfull read! you would say Hey thats a sawhorse. Language can be funny. Nice blog. I enjoyed reading it. Mads my friend, that is some beautiful wood to use on some sawhorses/ donkeys/ mules/ trestles. You are a good man Mads. Beautiful wood and work. You honored your brother. Trestle/Sawhorse English is a language made by taking words where every we find them and letting them help us communicate. Thank you for all the kind words, I smile here in Copenhagen. Laughed when I saw IKEA USA call them trestles. Guess that’s the end of that story. Rob, He was really happy and even happy to show them off (Perhaps even proud of his brother). Yes most languages are a mix of words form all over, English is manly taken from French, US English from England mixed with a lot of words and ways from all over the world. madts, since you are a boat man, I take that as a big compliment, my friend. Combo, nothing less than wonderful, I’ll call them caballetes from now. Cool! 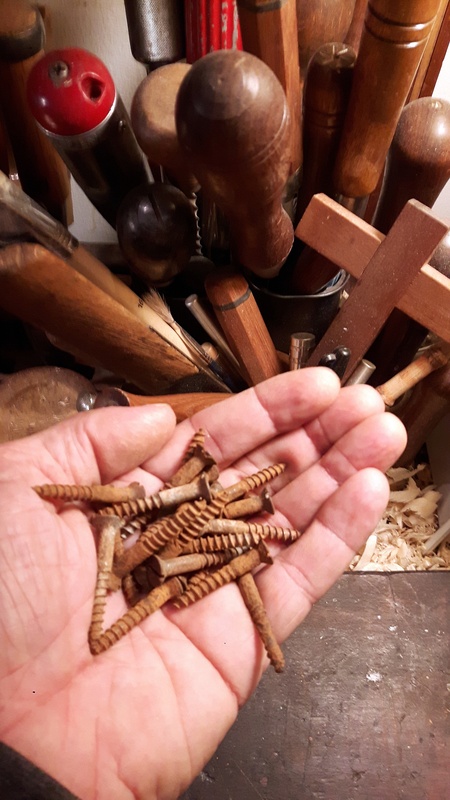 kaerlighedsbamsen, smiles here, yes I did not get enough shoptime with wood this year, mostly making hammock gear on a sewingmachine and I can hardly call it woodworking and post it here, even I have a wonderful time in the shop doing it. Thank you for opening your doors last time, so nice to see you and your wonderful house and workshop again (I struggle with the Underhill book, don’t really dig into that humor). Will see you soon. Zip ties are one of the handiest items around, I keep a good supply in varying colors and sizes. As for the trestles, whatever one chooses to call them, I’m sure your bro’ is happy. A gift, aesthetically pleasing and useful- doesn’t get any better.